Systems Group. Mr. Holman suc- ceeds Michael R. Bonsignore who has been promoted to president of Honeywell's foreign subsidi- ary, Honeywell Europe S.A.
Mr. Holman will be responsi- ble for MSD's two major business areas: naval acoustic equipment and offshore operations. He will direct the division's 1,500 em- ployees in the design, develop- ment, and production of elec- tronic systems for the offshore oil industry and military. D.C., is the contracting activity (N00024-83-C-2006). By preplanning the entire mod- ification, it was possible to install additional lift points and two new platform sections with only four weeks downtime, Mr. John- son stated. Company, Hydranautics' repre- sentative in Korea. Bath, Maine, has been awarded a $7,600,000 cost-plus-fixed-fee con- tract for design and material for the accomplishment of the post shakedown availability of FFG- 36, FFG-39, FFG-40 and FFG-42. Milwaukee, Wis., has been award- ed a $3,812,641 firm-fixed-price contract for 29 Louis Allis power supply engineering change kits, checkout services, engineering services, and associated support. 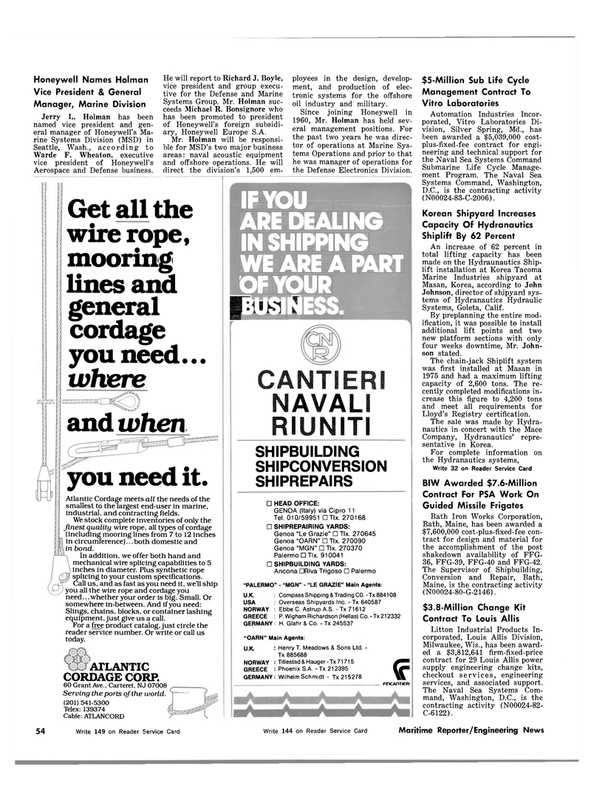 Get all the wire rope, mooring lines and general cordage you need... where and when you need it. Atlantic Cordage meets all the needs of the smallest to the largest end-user in marine, industrial, and contracting fields. We stock complete inventories of only the finest quality wire rope, all types of cordage (including mooring lines from 7 to 12 inches in circumference)... both domestic and in bond. In addition, we offer both hand and mechanical wire splicing capabilities to 5 inches in diameter. Plus synthetic rope splicing to your custom specifications. Slings, chains, blocks, or container lashing equipment, just give us a call. For a free product catalog, just circle the reader service number. Or write or call us today.